Summary: On Sunday, 3-3-2019, at approximately 10:20pm officers responded to a call for service where a witness/calling party was reporting a small dog that was being abused behind the businesses located at 431 East First Street. 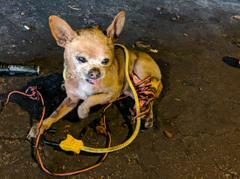 The calling party reported a male Hispanic adult had used wires to tie the dog’s legs and was kicking him repeatedly. 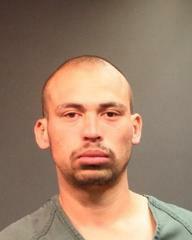 Officers were directed by the witness to the area and found suspect Jose Manuel Pantoja standing over the small dog. He was immediately taken into custody by officers without incident. 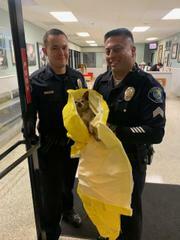 Officers found the small brown male Chihuahua with a bungee cord around his throat and chest. The dog also had multi-colored electrical wire around his legs. 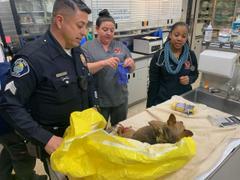 Officers transported the injured dog to Orange County Emergency Pet Clinic for treatment. The dog had multiple visible injuries. The suspect, Jose Manuel Pantoja was transported to SAPD Jail where he was booked for Cruelty to Animals. The suspect informed officers the dog did not belong to him and that it was just following him around and he did not know whose it was. On 3-4-2019, officers following up on the investigation were able to locate the dog’s owners. The small dog had escaped their yard after someone had left the gate open. The family was distraught and had been looking for their dog throughout the night. The 13-year-old dog “Max” has been with the family since he was a small puppy and is considered a member of the family. SAPD is working to reunite MAX with his family today.